Bolthouse Baby Carrots are cut and peeled perfectly from large carrots for greater convenience. Enjoy a crunchy delicious treat on-the-go! They are a fresh and healthy option to pack in lunchboxes or to dip in hummus for a satisfying snack. Bolthouse Farms, a leading carrot supplier, is committed to healthier products. They plant seeds that are bred for their sweet taste, small core, and optimal color/vitamin content, then harvested while still young and tender. Add Bolthouse Baby Carrots to your order today! Fresh salad blend that’s ready to be served. Enjoy a classic Caesar salad in seconds. 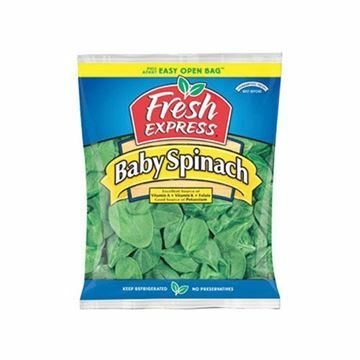 Small, leafy spinach greens packed full of nutrition.